About Map: Map showing where is Cape Verde located in the World. Where is Cape Verde located on the world map? 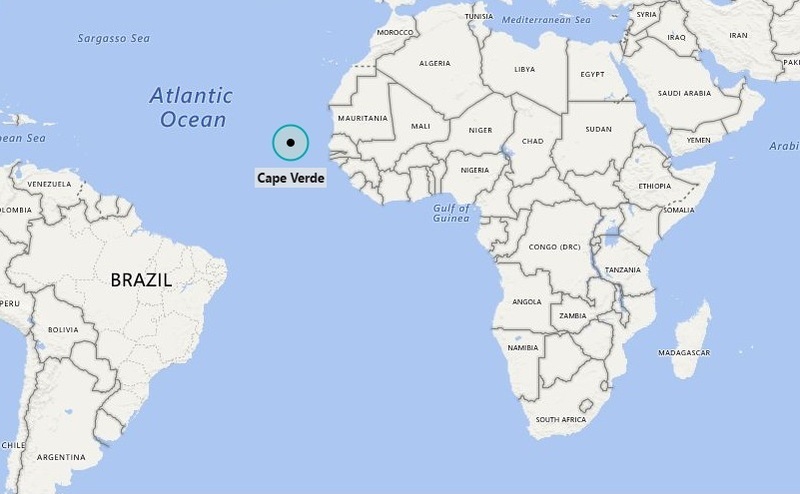 The given Cape Verde location map shows that the Cape Verde is located about 570 km off coast of western Africa. Cape Verde is an island country which originated due to volcanic activity. The other islands of the country i.e. Boa Vista, Sal, and Maio have fairly flat, sandy, and dry characteristics whereas other smaller islands are rockier along with some vegetation. Though, the island country is quite small but the Political System is quite stable. It has representative democracy. The constitution is formulated in the year 1980 and revised three times since then i.e. in 1992, 1995 and 1999 respectively. The president is elected by popular vote and he uses to be the head of state for 5 years term. The economic growth rate is also noticeable in spite of having no natural resource. However, at present the country’s economy is largely depending upon services. Besides, Cape Verde tourism is also becoming quite popular that has been also fetching handsome revenue for the country. The mild warm climate throughout the year and beautiful landscapes along with friendly native people and their rich culture collectively attract tourists from the different corners of the world.